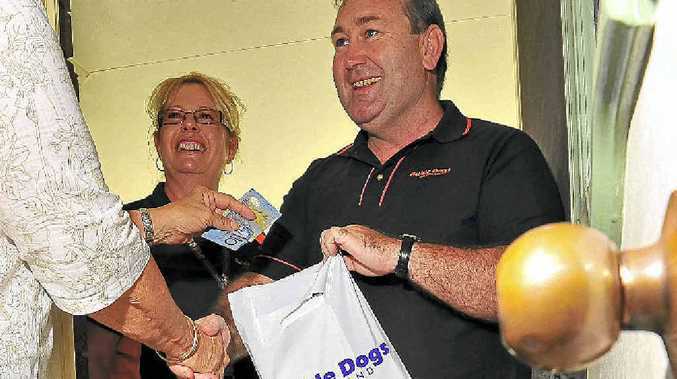 GUIDE Dogs Queensland is hoping Bundaberg residents will pause for paws during its annual appeal, which starts tomorrow. The "Paw Knock Appeal", which will run until Saturday, March 3, aims to raise $30,000 in the Wide Bay region to help the charity pay for the breeding, training and placement of a guide dog. The appeal kicked off yesterday when Member for Bundaberg Jack Dempsey made the first donation. About 200 volunteers are expected to doorknock homes over the next fortnight. Guide Dogs CEO Chris Laine said about 24 Queenslanders were on the waiting list for a guide dog. Anyone interested in becoming a paw knock volunteer should phone 4151 6722 or email .